• Save 60% to single purchase! This premium drum loop collection is awarded by artists like DJ Tiesto, Adam Beyer, Funkagenda, Jason Nevins, Tom Middleton, Jonathan Grant (Above & Beyond) to name a few, next to amazing reviews from Music Tech Magazine, Computer Music UK, Future Music and many others. You get unique kick-free material painstakingly crafted from scratch and exclusively for this sample treasure chest and does not contain any loveless low-cutted material. This collection of Sounds of Revolution contains one of the tightest, funkiest and most detailed kick free drum loops available. The name says it all! If you´re in search for state-of-the-art drum loops to boost your productions, here´s the place to discover – SOR Kick Free Revolution Vol.1! This library is power-packed with almost 700 unique kick-free material painstakingly crafted from scratch and exclusively for this sample treasure chest and does not contain any loveless low-cutted material. Furthermore the majority of loops, deliberately left without characteristic snares and heavy processing, come as construction kits that build up step by step, which makes “Kick-Free Revolution” highly fashionable for both studio and live work and perfectly suitable for the production of almost any genre of electronic music. This drum loop collection, universally produced on 127bpm and divided into categories “Experimental”,”Main” and “Perc Loops”, does not only leave enough space for your own creativity, but will even encourage it! 777 drum loops (!) – fx, hihat, tonal and percussion drum loops are both inspiring as such and leaving plenty of space for your creativity at the same time. Dedust your conventions, kickstart your signature sound with this fresh groove collection! SOR Kick Free Revolution is a must have for any producer or remixer. All the percussive drum loops are top notch and original. You’ll find only current progressive loops that will fit perfectly in any electro, club, house or dance track. The minute I got my hands on the SOR series- I put the sounds & loops to work in all my productions and big name remixes. A huge bonus is that not only do you get the product as standard .wav files- you get REX files, Apple Loops, EXS files (for all of us Logic users)and Kontakt files which give you total flexability. Go download this stuff now ! Loving your latest sample collection KICK FREE REVOLUTION Vol.1 ! Loads of usable stuff… Will deffo be using for my forthcoming live set up! 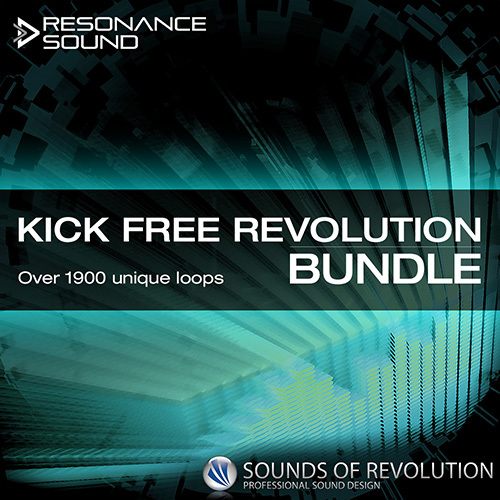 KICK FREE REVOLUTION is the best sounding loop libraries I have ever encountered. The most inspiring loops ever. These loops are brilliantly fresh – sounding close to what’s booming out of most clubs’ main floors. It´s fantastic !!! The sample pack KICK FREE Revolution is essential – what’s great is the material sounds very fresh. We’re already using this in our productions, and it’s very easy to drop them into apple loops and get working straight away. Very complex grooves and well constructions. The sounds are unique! You really get inspired by the grooves. It´s a high quality production, it dosn´t matter what style you like, techno or house etc.., it´s perfect to get a new idea. SOR delivers nice grooves and interesting sound elements in a very good quality. I already chopped me some slices for my productions. KICK FREE Revolution Vol. 1″ is a well-constructed and innovative collection of usable and inspirational samples by German producer Oliver Schmitt. It?s fresh and original. Highly recommended! The Sound Of Revolution Series are not only one of the biggest and diverse sample packages available at the moment, but most important is that they are unbelievable usable! Looking for a fresh sounding loops for EDM or any other musicstyle…you got it. Looking for a tight fitting bass sound…no problem. At the moment we are working on a couple of new Ernesto vs Bastian tracks and remixes and all we can say about that is that we used quite a bit of the massive sounds of SOR. Recommended! 5 STARS! Die Loops bestechen wie auch schon bei der FX Revolution Vol.1 durch einen klaren, druckvollen und rauschfreien Sound. Die Loops sind alle samt neu und keine abgewaschenen Beats die man schon 1000 mal gehört hat. […] Im Gegensatz zu dem ein oder anderen Mitbewerber hat man sich hier nicht an einen Lowcut Filter bedient und einfach alle tiefen Frequenzen abgeschnitten, sondern gleich ohne Bassdrum produziert. Meiner Meinung nach die beste ‘No Kick Sample CD 2009’. nice synthetic sounding […] immense groovy […] very varied […] absolut inspiring and a must buy! […] Im Gegensatz zu den Vengeance-Libraries von Mutekki zeichnet sich Kick Free durch eine größere Formatvielfalt aus. Neben den WAV-Dateien in 24 Bit gibt es auch die Formate AIFF und REX sowie fertige Mappings für EXS24 und Kontakt. Kick Free Vol. 1 widmet sich nur einem Thema, dafür aber mit großer Aufmerksamkeit. Diese Fundgrube ist eine echte Empfehlung. …] Wie der Name schon sagt erwarten einen hier “Kick Free Loops”. Der Untertitel verspricht, dass es sich um “Unique Loops by Oliver Schmitt” handelt. Das ist mittlerweile schon fast ein Gütesiegel in der Branche und auch ich konnte mich nun schon mehrfach davon überzeugen, dass die Loops sich erfreulich von manch anderer Library abheben. Alle Loops liegen hier in 127 BpM vor. Natürlich lässt sich das Tempo variieren. In Stylus ohnehin und in Kontakt ist Timestretching aktiviert. Dem müssen doch mal irgendwann die Ideen für neue Loops ausgehen, ist während des Tests einer meiner Gedanken. Aber weit gefehlt: Neben seinem Sohn ist sein größtes Hobby nach eigenen Aussagen das Schrauben an wirklich handgemachten Loops, die erst dann gebounced werden, wenn Sie richtig grooven. Und das trifft hier zu. Wer sich selber überzeugen möchte, der kann sich unter www.sounds-of-revolution.com freie Samples herunterladen. There are a lot of drum loop libraries that offer great drum patterns. They are useful, they sound full and are ready to use by themselves no doubt, but the problem sometimes is that it’s hard to integrate them into your own drum mixes. Enter Kick Free Revolution Vol. 1 and 2, a collection of drum loops crafted with very little or minute low-end. The idea behind a kick free library is nothing new, yet it is clever. It’s intended to give producers a mix and match option for building new and unique drum patterns. The first volume includes 684 loops all recorded at 127 BPM. Most of them would be suitable for electronic music such as Techno and House, but depending on your creativity, you can use these sounds any way you see fit. The samples are broken down to three main categories: “Experimental” will give producers effects and “something different” sounds, “Main” contain samples that are more of your typical everyday loops and “Perc” would work perfectly if you need realistic percussion elements. While Vol. 1 is delivered in DVD disc format, Vol. 2 is a downloadable product at Sounds-of-Revolution and Sounds/To/Sample sites. Continuing where Vol.1 left off, this library of 611 loops has basically the same formula as the original but it includes 70 deep, round kicks as a bonus. Oliver Schmitt, the man behind SoR, has sprinkled this collection with more diverse-sounding materials than the the first one. You’ll find a bunch of hi-hat patterns, 140 club-oriented sounds, tonal loops with 52 melodic beatlines and 100-plus glitched-out loops for experimental enthusiasts. They say that sequels are supposed to be better than the original, and Vol. 2 delivers. Although both libraries are kind of pricey, they are superbly programmed with many usable sounds. An excellent follow up of the Kick Free Volume 1 set. Easy to fit in any production because it has everything ranging from tight and dry hihat loops to creative beats with effects, clicks, percussive sounds and extreme beats. The loops are labeled, so that makes it even easier to find the sounds needed. If you’re making House/Tech grooves, then Oliver’s pack of pristine, swinging kick-less starting points and groove enhancers will set you up for months, if not years! Fantastic value as per usual, with nearly 1 and a half Gigs of diverse ‘tops’ across the spectrum from tribal to glitchy/minal electronic styles. Plus 70 solid Kicks to add..never seem to get enough Kicks right(!) All in all, gets a massive ‘LIKE’ from me. The Sound Of Revolution Series are not only one of the biggest and diverse sample packages available at the moment, but most important is that they are unbelievable usable! Looking for a fresh sounding drum loops for EDM or any other musicstyle…you got it. Looking for a tight fitting bass sound…no problem. At the moment we are working on a couple of new Ernesto vs Bastian tracks and remixes and all we can say about that is that we used quite a bit of the massive sounds of SOR. Recommended! 5 STARS! The sample packs and soundsets of “Sounds of Revolution” are a MUST have for any producer looking for quality production material. They totally hit my creativity spot and I already have my favorite sounds and drum loops after just skipping through the libraries a few minutes. These will find their way into my productions for sure! I think the whole SOR series are a grail of good stuff actually useful to find their way in real records. Even if I don´t really use drum loops, the way the loops are produced in this series makes it easy to chop and cut them up into easy-to-isolate one-shot samples. I chopped up big parts from Minimal Tech Revolution and Kick Free Revolution. Takes time, but its really worth it. No resampled samples from other sampled stuff that took their samples also from other tracks/samples. No overused dynamics or effects and stuff, so you can easily tweak them to your own style. Thats what the most important for me and the biggest failure and mistake of nearly all other sample libraries. The amount of useful one shot samples that I got out of this series is massive. And I absolutely love the experimental section. Ein kleiner Ausflug zum Thema “RAM vs. Preis”: An dieser Stelle muss ich mal ein “ernstes” Wort zum Thema Speicherbedarf loswerden und eine Lanze für Sounds-of-Revolution brechen. Was mir mittlerweile bei diversen Tests aufgefallen ist: Mehr MB bedeutet meist mehr Gegenwert, welcher sich üblicherweise im Kaufpreis niederschägt. Daher hat es sich “eingebürgert”, dass etliche Produzenten die Loops sogar bis zu vier Mal (!) hintereinander bouncen um anschliessend mit dem “großen” Samplecontent zu werben. Wenn man genauer hinschaut, ist das in diesen Fällen eine Mogelpackung. Leider fällt das auch bei einigen Tests nicht direkt auf. Wir werden auf dieser Webseite in Zukunft noch genauer hinschauen und Euch über solche Libraries informieren, wo unnötig lang geloopt wurde aber mit großem Content geworben wird. Positive Beispiele gibt es natürlich auch: Die Loops von Sounds-of-Revolution sind alle nur so lang, wie nötig. Es wurde nicht derselbe Loop mehrfach wiederholt, nur um den Speicherbedarf in die Höhe zu treiben. Wenn es mehr als einen Takt gibt enthält der zweite auch eine kleine Variation. Die 424 MB sind “echte” 424 MB an frischen Loops. Der von Oliver Schmitt aufgerufene Preis von nur 46,95 EUR ist für mich ein Dankeschön an seine Kunden und eigentlich im Vergleich zur Konkurrenz viel zu günstig. Da hätte er wesentlich mehr nehmen können und bräuchte kein schlechtes Gewissen zu haben. Fazit: Olliver Schmitt hat es wieder einmal geschafft, eine hochwertige Sammlung an Loops abzuliefern. Die Sortierung ist gelungen und etliche Formate werden bedient. Dazu gibt es noch 70 sehr gute Kicks als Bonus. Und das zu einem Preis, der wirklich absolut konkurrenzlos ist. Wer hier nicht zugreift, ist selber Schuld. If I had to choose one word, it would be “groove”. This is a collection of funky, groovy top loops?you know…the stuff that moves the track along? No synths, no bass, no pads or fx, straight up top loops. Glitches, blips, and other funkiness to give your track that ‘life’ […] How do they sound? Authentic…at least to me. Now I may not be an authority on house music, but I know a groove when I hear it…and I also know the types of sounds I look for. Experimental glitches, blips and bleeps…funky breaks and percussion, all with room to add your own kicks and drums to the mix. Well recorded, well produced and just plain fun to play. This is the first sample collection I have reviewed from them, and I can see why people like their products. They give you what you need, nothing more. I look at top loops as the icing on the cake, or if you want to go minimal they can be the whole cake! But they have to sound good and be recorded well, these loops live up to that challenge. So what’s the bottom line? This is a good collection for those that like to step out of the norm when it comes to sounds they incorporate into their music. Or it’s great for those specifically looking for some funky house grooves to add to their productions. I give this collection a 4 out of 5 subs. I like the overall feel of the collection, and it’s very useful. I did feel it got a bit repetitive in some parts, but not much, mainly in the glitchy sounds and loops but then again, a glitch is a glitch and the way they were produced provides enough variety. Taking into account the target of the collection? ‘top loops’ it lives up to and provides a great collection of grooves you can quickly infuse into your tracks. Now we’re talking. SOR’s Oliver Schmitt returns with another impeccable pack for dance musicians. This library provides over 500 percussive loops for all four-to-the-floor dance genres: minimal, electro, trance and house of any flavour will benefit from this collection of glitchy, clicky, processed joy, categorised according to their general style. The clever bit is that all loops are programmed from scratch, but come sans kick drum. Thus it’s easy to use them in your productions and drop your own kicks in there (70 bonis kicks are thrown in too). We could even imagine some of these loops working their way into DnB and breaks tunes: the superior production quality means that you’ll be satisfied even if you just grab a short section of each loop. This one is just shy of classic status – it’s not quite unique enough for that – but that’s certainly not to disrecommend it in any way. Good: Good, original material which spans from classic dance music hihat/percussion patterns to the odd (but not too odd) and fresh. Bad: No big critisism here. Doch nun zur Kernfrage – wie klingt das Ganze ? Wirklich einzigartig und auffallend frisch! Kein Wunder, steht doch der Name SOUNDS OF REVOLUTION seit dem ersten Sample Pack für völlig neu produzierte und wirklich innovative Loops, wie man Sie bei keinem anderen Anbieter findet. Das Ganze klingt sehr unaufdringlich – man wird also nicht mit übermässigen Effekten wie Hall & Delays überfordert. Das steigert die Kreativität enorm und der Produzent bleibt flexibel. Die Loops fügen sich somit perfekt in jedes Arrangement ein. Im Vergleich zu manchem Mitbewerber gibt es auch hier wie immer keinerlei gerippte Loops, bei denen z.B. einfach per LoCut Filter die Kickdrum entfernt wurde. Dadruch, dass das gesamte Frequenzspektrum bedient wird, sind die Loops sehr universell einsetzbar. Das macht KICK FREE REVOLUTION Vol.2 auch aus – völlig neue, ungehörte Loops, die wunderbar grooven und die perfekte Basic bilden eine ordentliche Rythmusstruktur aufzubauen. Schmitt stellt wieder einmal sein Gespür für den Praxiseinsatz unter Beweis. Neben sinnvollen Kategorien ist auch das Auffinden des einzelnen Loops hier sehr gut gelößt, da jeder Loop namentlich benannt wurde – weitaus effektiver als lieblos durchnummerierte Loops. Was mir auch hier wieder einmal lobenswert aufgefallen ist: Gerade heutzutage, wo immer wieder mit grpßem GB-Kontent geworden wird, gehen Hersteller oft dazu über, gerade Loops unnötig lange zu bouncen, um den Kontent künstlich in die Höhe zu treiben. Kritisch betrachtet ist das aber eine Mogelpackung und dient nur dazu den Käufer zu blenden. Bei KICK FREE REVOLUTION Vol.2 wurden die Loops nur so lange gebounced wie wirklich nötig. Ein Detail was SOUNDS OF REVOLUTION von so manchem Mitbewerber massiv unterscheidet. Daher ist der Preis in Anbtracht des Gebotenen ein echtes Schnäppchen! The first volume includes 684 loops all recorded at 127 BPM. Most of them would be suitable for electronic music such as Techno and House, but depending on your creativity, you can use these sounds any way you see fit. The samples are broken down to three main categories: “Experimental” will give producers effects and “something different” sounds, “Main” contain samples that are more of your typical everyday drum loops and “Perc” would work perfectly if you need realistic percussion elements. While Vol. 1 is delivered in DVD disc format, Vol. 2 is a downloadable product at Sounds-of-Revolution and Sounds/To/Sample sites. Continuing where Vol.1 left off, this library of 611 drum loops has basically the same formula as the original but it includes 70 deep, round kicks as a bonus. Oliver Schmitt, the man behind SoR, has sprinkled this collection with more diverse-sounding materials than the the first one. You’ll find a bunch of hi-hat patterns, 140 club-oriented sounds, tonal loops with 52 melodic beatlines and 100-plus glitched-out loops for experimental enthusiasts. They say that sequels are supposed to be better than the original, and Vol. 2 delivers. Although both libraries are kind of pricey, they are superbly programmed with many usable sounds. Reviewers favourite Olli Schmitt and his Sound of Revolution label return with volume two of Kick Free Revolution, 600+ drum loops of tight tops at 127bpm. It’s not hard to guess we were amazed reviewing this product. And besides a sometimes too excessive stereofield usage we were not able to find negative aspects. You get top-notch quality, huge variety and usability ‘Sounds of Revolution’ has proven once more why their products are one of the best out there. We’re looking forward to Vol. 3! Oliver Schmitt is a man driven by a passion. Just like Deadmau5, Oliver Schmitt knows the art of creating drum loops that sound spot-on modern with a minimum of ingredients. For someone like me – who rather add than take away – it’s almost like dark magic. But as the old idiom famously says ‘the devil is in the details’ – and that’s what Oliver Schmitts drum loops are all about. Tiny details that you barely register but perceive as a whole. […] The reason for this is that these loops do not only lack the kick but also the snare. The omission of the snare might sound like a simple trick, but it makes the all difference in the world when it comes to actually use the loops in your own productions. This does it make very easy to build dynamic drums for entire track – with your favorite snares and kicks. Being a somewhat decent producer myself – I marvel at the cunning steeped in this drum loop collection. The sounds are both carefully selected and masterfully processed. The usage of tonal elements is very clever and the loops are very dynamic – giving a feeling of ebb and flow. If you are after the kind of sounds that will help you concur the charts of modern trance pop, this is probably too advanced for your audience. But if you are into modern electro and techno – or want to spice up your productions with those genres – there are few collections that will make you stand out in the same way as these loops will. People will think your production skills are way more advanced that they really are. One final note about the price. In these days when you can grab gigabyte-sized libraries for 10-20 euros, a price of 64 euros is definitely high. But since the quality of these drum loops is so exceptionally outstanding – Kick Free Revolution files under investment, rather than expense. Good: truly excellent kick free drum loops. Bad: Nothing really. It is well worth its price. Rating: “Get it now” AWARD! Although I really enjoy programming my own drums, loops can sometimes be lifesavers in adding a specific feel or groove. The trouble is, most drum loop collections are of full drum parts, so if you want to mix your own drum programming with the loops, you have to try and EQ out the kick, or your low end turns to audio mush. Wouldn’t it be great to have just the elements that lend the groove without all the other bits? That’s exactly the idea behind Kick Free Revolution Volume 3 from Sounds of Revolution. Divided into categories of Kit Loops (electronic hats, thips, perc, and occasional simple snare parts), Hi-hat loops (just what it sounds like), Live Percussion Loops (acoustic percussion loops), Minimal Loops (bleepy/twonky electronic loops perfect for minimal and tech house), Mixed Loops (loops created with all sorts of sounds), Noise Loops (interesting loops created with white noise), Synth Perc (just what it sounds like), and Tonal Loops (loops with tuned percussion elements). The loops all clock in at 127 BPM, but if you’re using the REX/Stylus format, you can change the tempo of most of these loops across a fairly wide range of tempos without unwanted artifacts.